WATCH! 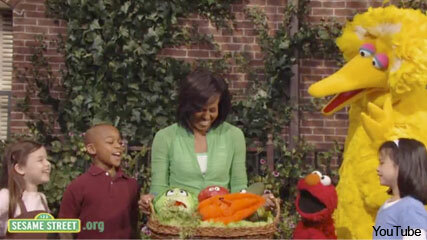 Michelle Obama on Sesame Street! The First Lady pals up with Big Bird and Elmo to celebrate the 40th anniversary of America's longest running children's TV show. What a way to celebrate! To mark their 40th anniversary, the residents of Sesame Street welcomed their most illustrious guest to date – none other than Michelle Obama. In an episode set to air later today, America’s First Lady will help mark the show’s big birthday, by palling up with Big Bird. Previews show that Michelle and her feathered friend bond over being the tallest on the street, and club together to promote healthy eating and nutrition. 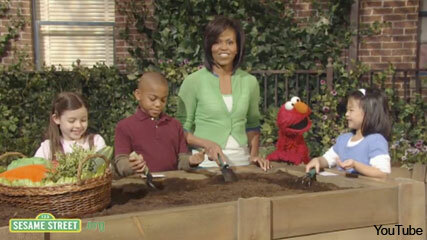 The episode, which was taped back in May, also sees the First Lady having a run in with that cheeky chappy Elmo, and planting vegetable seeds with a group of children. Sesame Street is the longest-running children’s programme on American telvision, and has brought us much loved characters including the Cookie Monster, Oscar the Grouch and the inseparable Burt and Ernie. Check out this super-cute clip from Mrs O’s Sesame Street debut, and let us know what you think in the comments box below!